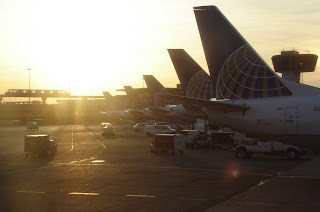 Transiting Newark, I found myself in a row of Continental 737s at sunset. Continental claims to have a very young fleet, and the recent 6 segments I flew agrees with this. The picture was taken while aboard N34282, only 5 years old. As a comparison, my most recent flight on Northwest was on N760NW, a DC-9 that was built in 1968.